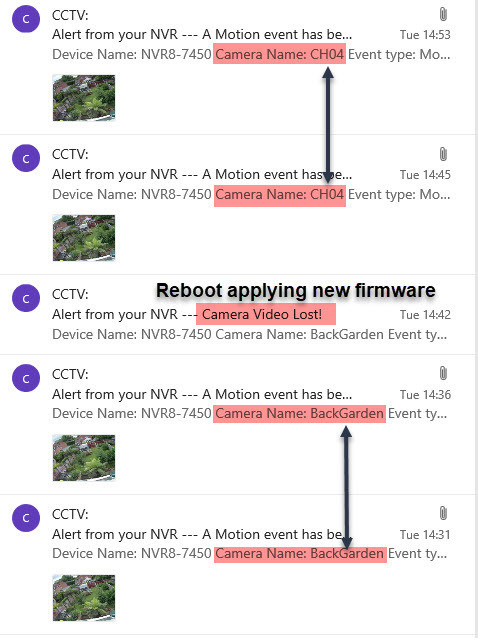 Alert from your NVR — A motion event has been detected on one of your cameras; please check the attached image for reference. I've tried several settings at Support's suggestion - even done a "Load Defaults"
One each camera feed, I see my Camera's Name - eg. BackGarden, the Date & Time, and also "CH4"
"Seems that it is one of the limitations of the latest OTA version. The Development Team is working for a new firmware release that will target not just the email alert related issues but some improvements with the over-all functionalities of the unit. We do not have the ETA for the firmware release yet but once it is available, you will be notified via OTA as well"
I'm a little surprised that no one else has said "me too"
Sorry to hear you are experiencing trouble with the firmware upgrade and I am also very surprised to see no one else has said "me too"! I had not seen your thread or even noticed your issue yet but will certainly be looking out for it! Please see the link below to my thread on here regarding my particular issues encountered with this so-called 'update'! Hoping this helps some of you folks out there in some small way. Not exactly a "Me Too" but am having problems since the update. My first sign anything was wrong was 2 cameras becoming inverted, and no overnight activations, and now its not much use! Support was quick to answer but refused to acknowledge either it being a software issue, or that a fix is iminent. I have searched unsuccessfully for an answer, and Swann doesn't respond to my emails, so, do you know if a fix is out there? I had to go to Level2 to get it (v7.1.0-20188010) - even then, L2 wouldn't give me the link, they insisted on a remote-control session, and copy & pasted the link and initiated the download from a non-public dropbox.